Grammatico Amps feels, as many do, that the amps from the early years had vibe, excitement, inspiration, soul and magic while modern amps as good as they are in technical terms, are cold and sterile leaving you uninspired and wanting more. It is our mission to build amps using modern reliable and tighter tolerance components that capture the mojo of the great amps of yesterday. To acheive this, a lot of testing and trial and error is involved. Tone is still very much a black art and is akin to a great recipe with all the right ingredients coming together in the right ratios in a synergistic way, to achieve perfect balance and satisfy the senses. Unfortunately the majority of off the shelf and readily available parts fall short, so we’ve had to resort to having much of our own components custom made and sourced from around the world. This is the extent we’ve had to go to get the results we’re content with. Once the individual components have been selected for their characteristics and synergistic qualities, then circuit tweeking takes place and the recipe is formulated. 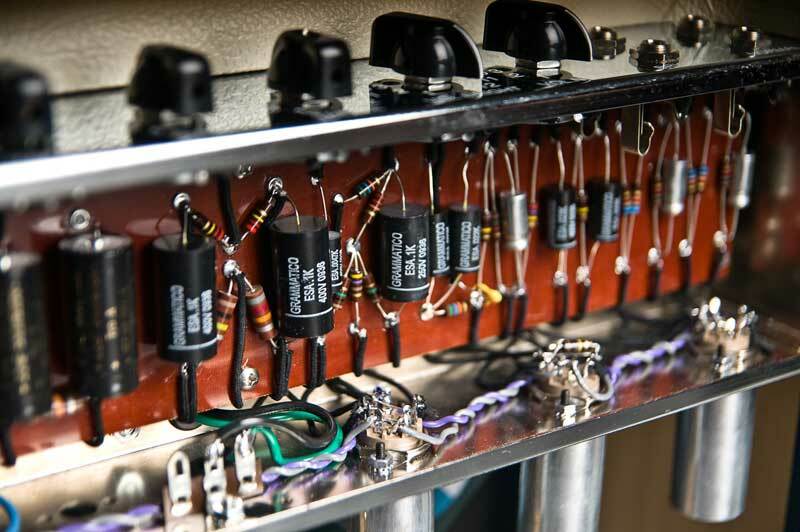 Then each amp can be built to exact copies with consistency. We also strive to build amps of great value. We put most of the expense under the hood where it’s not seen but it is heard and felt. It’s the music and the connection that’s most important to us, not the image.